Mmmm, I love a good lemon loaf! I’ve made a few before: lemon olive oil cake, and a few that I am just now discovering I haven’t actually posted before… more to come! But this is definitely the first cake I’ve ever made in a blender! Okay, so you need bowls and stuff too, but I liked how quick it was to blend up the liquid ingredients. Anyways, this one wins points because of the lemon drizzle that adds a nice lemony kick to balance the sweetness of the cake. 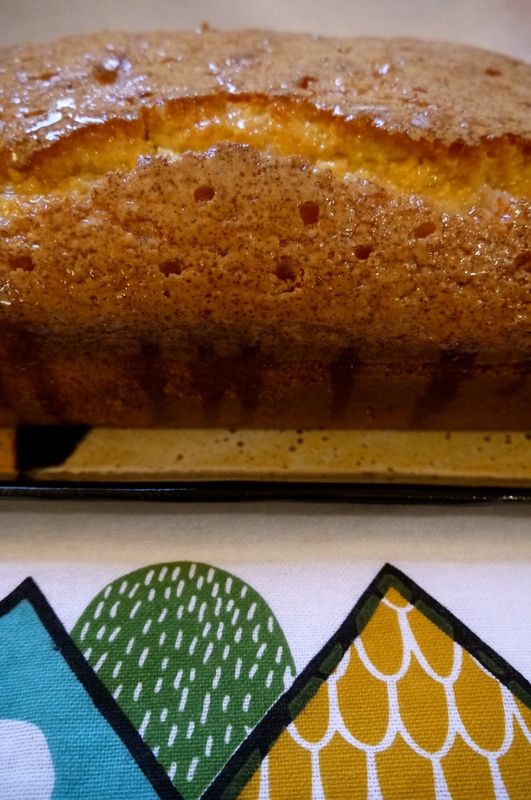 The original name, in the Cook’s Illustrated Cookbook, is Easy Lemon Pound Cake. And it is easy, and lemony, but there’s only 1/2 pound of butter in there! Preheat the oven to 350F and place the rack in the centre of the oven. Grease and flour an 8 & 1/2 by 4 & 1/2 inch loaf pan. I use the wrapper for the butter to grease the pan, then shake some flour around in it. Melt the butter, then whisk it to combine any separation. Place the sugar and lemon zest in the blender (or food processor) and pulse about 5 times. Add the lemon juice, eggs and vanilla, then blend until combined. With the blender running, add the butter. Pour the mixture into a large bowl. Sift the flour mixture into the batter in 3 steps, whisking gently each time until just combined. Bake for 15 minutes, then lower the heat to 325F. Bake, rotating the pan halfway through, until the loaf is a deep golden brown and an inserted toothpick comes out clean. This should take about 35 minutes, although mine took much longer. Let the loaf cool for 10 minutes then turn it onto a wire cooling rack. Poke the top and sides all over with a toothpick. I used a chopstick, which is why the holes are so visible. Cool the loaf for at least one hour. While the loaf is cooling begin making the glaze. Bring the lemon juice and sugar to a boil and stir occasionally to dissolve the sugar. Reduce the heat and simmer until it has thickened slightly, about 2 minutes. Brush the top and sides of the loaf with the glaze. This loaf will keep at room temperature for about 5 days. It will probably be gone before that, but it won’t go bad if you hang on to it. 1/2 pound cake is a great name for it. Sounds good with fruit on it! Maybe it’s a 1/2 pound cake since it’s not a pound either of sugar, eggs or flour. I like to make pound cake and put sliced fruit, like strawberries, over it.